Deep breaths. It’s happening. WhatsApp Web just went live. Wait, where did you run off to scrolling to the bottom of the page for the link? I have important things to discuss here, like the latest Archer episode. Literally. OK, OK, I won’t stall any longer. 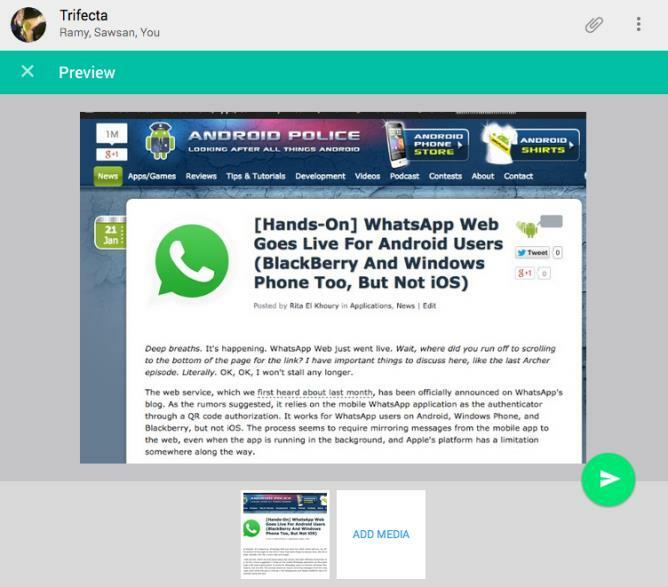 The web service, which we first heard about last month, has been officially announced on WhatsApp’s blog. As the rumors suggested, it relies on the mobile WhatsApp application as the authenticator through a QR code authorization. It works for WhatsApp users on Android, Windows Phone, and Blackberry (and Symbian! ), but not iOS. The process requires mirroring messages from the mobile app to the web, even when the app is running in the background, and Apple’s platform seems to have a limitation somewhere along the way according to the WhatsApp devs. In order to use WhatsApp Web, you need the latest version of the app from the Play Store, 2.11.498 (or above). 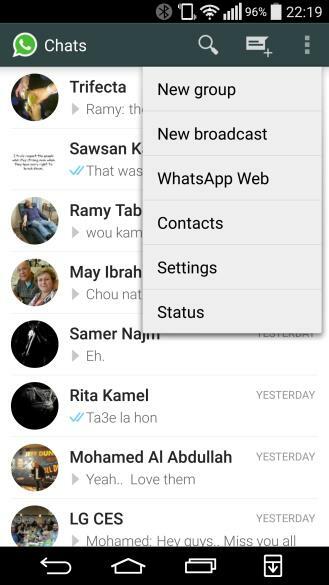 In the menu, you should see WhatsApp Web as a new option. If it doesn’t appear there and you’re running this version, try force closing the app and restarting it — that seems to do the trick for some users. Now, head over to web.whatsapp.com on your computer’s Update: Chrome browser. 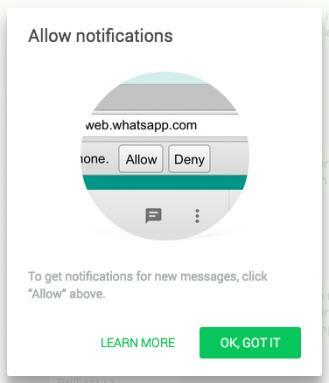 Yes, WhatsApp Web is a Chrome-only option for now, it will not work if you use other browsers to access the web like Safari or Internet Explorer. It does, however, seem to work with Opera. 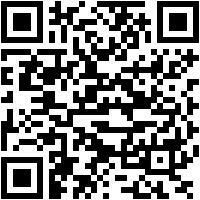 A QR code will be generated for you to scan with the phone. Once this authentication is complete, you’re in. It’s a land where magical things happen, like being able to reply to your friends faster than lightning thanks to a full keyboard. 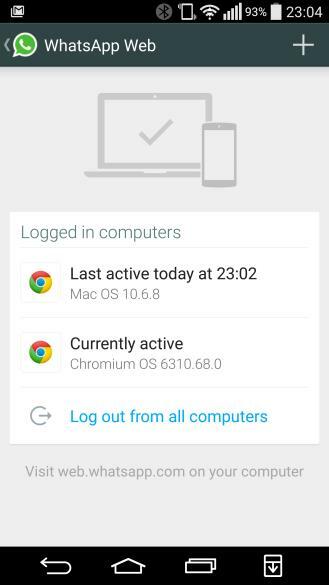 You’ll need to keep your phone connected to a network to maintain the mirroring, but you don’t need it and Chrome to be on the same network and you don’t have to keep the WhatsApp app in the foreground. You can switch to other apps, let your phone’s display turn off (as long as the connection stays alive then) and you’ll still have the web version running. While its Android brethren hasn’t been “materialized” yet, WhatsApp Web takes a few cues from Material Design, colors, iconography, FAB, and all. Much Material. So FAB. Wow. 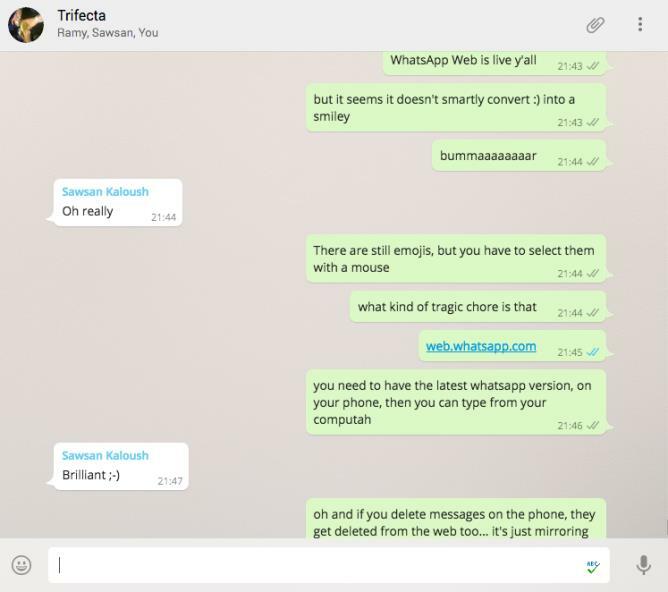 And WhatsApp Web seems to be almost complete too, from a feature standpoint. All of your conversations are mirrored, with the option to start a new one with your contacts. Even when you delete messages on your phone, the web view reloads to reflect that change (though you can’t seem to be able to delete messages from the browser yet). Emojis, image attachments, and voice notes are supported too, whether you want to send or receive them. Group and people info are available when you click the corresponding avatars. As for your own profile, for now, you only seem to be able to check your photo and status, but not update them. 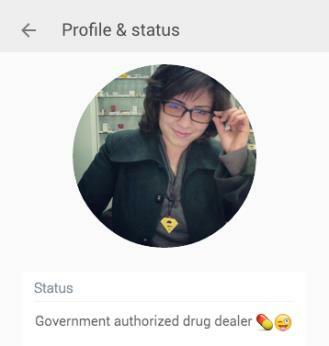 You can’t tinker with your WhatsApp settings either. 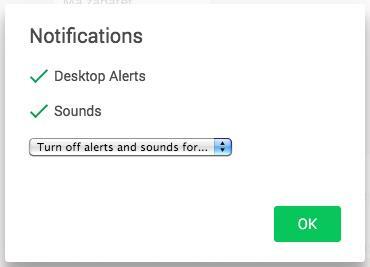 The only setting available, however, is for notifications. And yes, it feels glorious to receive a WhatsApp notification when I’m working on my computer and be able to respond to it without having to pick up my phone. Freeeeedoooom! Maybe you think I’m overstating the importance of this. But when you live in a country where more than 90% of your communications happen through WhatsApp, you would have read about the joy others felt when using PushBullet or MightyText to reply to SMS messages from their browsers and hated it for not being possible with WhatsApp. Why do you have to interrupt everything you’re doing on your computer to check the link to the latest cat photo your friends sent you? It isn’t clear to me if the browser authentication times out at any point, requiring another QR scan. Update: There’s a “Keep me signed in” checkbox when you first open WhatsApp Web that is enabled by default. 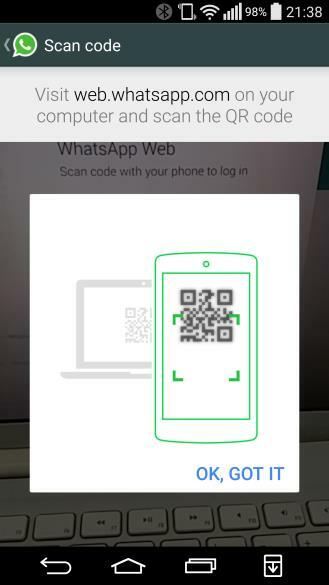 If you uncheck it, WhatsApp Web will not log you in automatically and will require a QR scan every time you open it. If you didn’t uncheck it and you want to, simply log off and re-open WhatsApp Web, you should see the first page again. When the phone doesn’t have a connection, WhatsApp Web will keep working if the browser tab was already open, and you can type messages in Chrome to be delivered once your phone is online again. That’s not very secure — it seems that the entire system relies on you having some form of protection preventing others from accessing your browser to begin with. Beside unticking the checkbox, the only security measure I found was when trying to open WhatsApp Web in Chrome on a previously-authenticated device, but with the phone offline. It wouldn’t connect and load previous messages. For now, if you don’t want anyone snooping in on your conversations and you suspect that other people may have access to Chrome on your computer, even when you are away from it, you’re better off deselecting the checkbox and authenticating by scanning the QR code with your phone when you want to use the service. 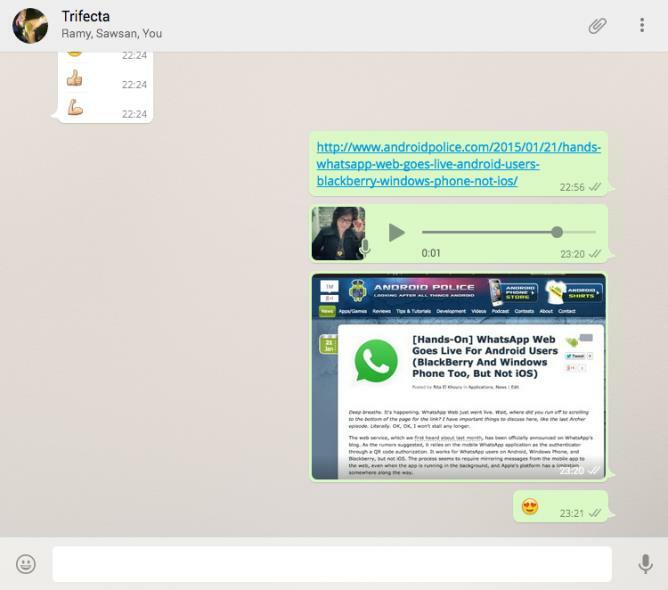 WhatsApp Web has expanded to support the Firefox browser on Feb 26th, along with Chrome and Opera — thanks Jair Moreno! Thanks to the hundreds of you who sent this in!